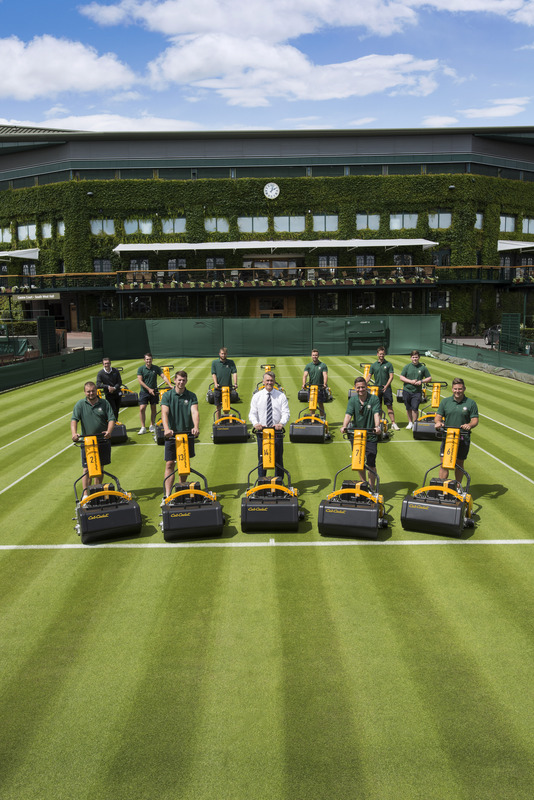 Made in Britain member, MTD Specialty Turf Products (formally ATT) has completed the order of 18 Cub Cadet Infinicut™ mowers to The All England Tennis Club at Wimbledon. The Cub Cadet Infinicut™ is a visually striking machine and has one of the shortest footprints of any walk behind mower on the market allowing ultra-low heights of cut. The order comprised fifteen 21” models and three 30” variants and just 3 weeks before the tournament commenced, the grounds team took time out to line them all up for a photoshoot. The Wimbledon venue is in close proximity to housing, and the site itself is compact with lots of closed structures within it, so switching over to a mower that produces extremely low levels of noise has been welcomed by all. Tennis courts need a mower of 21” width in order to facilitate equal striping over the courts, and the 22” Infinicut™ was easily adapted to accept 21” cutting reels. The reel motor position was also an issue but again switching it over to the opposite side, in order to present a clean side of the mower to the edge of the court, caused no problem. Adaptations of this kind are possible because of the ‘state-of-the-art’ design of the unit where most other products on the market haven’t changed much in forty years. They also took delivery of a number of SMARTUltraGroomer cassettes to go into the 21” units. These cassettes remove huge amounts of debris, resulting in a smooth surface, with no detrimental effects on the surface. The cassette will also remove seed heads in Poa annua turf and on newly established courts, it can help reduce the ingress of Poa annua by “grabbing” individual plants before they get a chance to take hold.